I don't believe our inaction is because we don't think about the change but rather it is because we imagine the story is deeper than what we are told, because we know there are lot of behind closed doors activities and we are being blinded from the truth. We know the media tries but we don't believe they are doing enough or telling us the truth because they are powered by those who fund them. We want to create change but we wonder which issue to tackle first and is the change we do on a personal scale going to make a global impact? So we question if it's every man for himself at this point, survival of the fittest maybe? Or is there hope in joining forces, coming together, loving each other, seeking peace and challenging the chaotic status quo? It is not that we don't think about the change, it is that we have mastered the art of silence, and embraced the doom of negativity, fear, and destruction- what used to become unspeakable has become tolerable and acceptable; so morality has been thrown in the trash. We have become a world of our own voices raised against God so we can't hear God speak to us anymore and we take matters into our hands. Churches have become mute to the challenges the world faces because they want to be politically correct and do not want to upset anybody. They fail to speak about matters of time and train our mindsets on how we should approach the world in confidence of love of God, they fail to teach us about morality, right and wrong so the church has isolated themselves from the state of the world in the name of refusal to upset..... The Church is only a segment but what about our leaders in power, I fear that many of us are behind dealing with our day to day as so we should, but can we really place trust in the hands of those in power in every nation really but do we even have a choice? The uprise in the middle east began as a cry for change and things have taken a turn towards making humanitarian history unfortunately with the death tolls not slowing down and now the biggest refugee migration from Syria happening today. This is the world we live in and the realities of our time, climate changes taking drastic turns and we are facing a huge scare of lack of natural resources facing our generation... this is a glimpse into the Syria statistics and a piece of note on the climate related to economy geography just to create awareness... I leave with you at the end, questions to ponder about because we have to think about how the story of our generation will be told. To define for ourselves what matters and what does it mean to be alive in today's times? Where do we begin from? 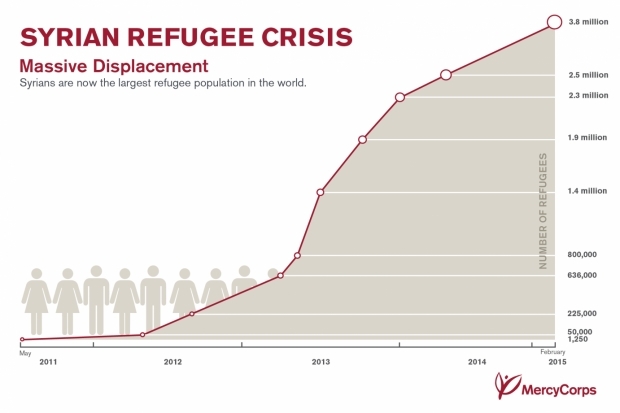 It is one of the largest refugee exoduses in recent history according to BBC and the worst exodus since the Rwandan genocide 20 years ago according to Mercycorps. WHAT CAN WE DO? : DONATE perhaps? or SHARE? OR SIGN ? May be this video "The Lie we Live" by Spencer Cathcart paints a more general picture for us? The questions: WHAT DOES IT MEAN TO BE ALIVE TODAY? WHAT IS THE ART OF BEING ALIVE TODAY? WHAT IS THE ART OF LIVING TODAY? HOW CAN WE CARVE OUR OWN BATTLES IN THE MIDST OF THE CHAOS? HOW CAN WE BE MORE OF LEADERS INSTEAD OF FOLLOWERS OF CELEBRITIES AND FIGURES THAT JUST STAND AS A FALSE IDEA OF HOPE? HOW CAN WE RE-WRITE THIS SCRIPT AND HOW WILL OUR STORIES BE TOLD? WHAT CAN WE DO TO HELP OURSELVES IN CONSERVING RESOURCES AS MATTERS OF DROUGHT AND SCARCITY FACES OUR FUTURE? WHAT CAN WE DO TO HELP ANY OF OUR FELLOW BROTHERS AND SISTERS AROUND THE WORLD SUFFERING TODAY? WHAT CAN WE DO TO MAKE A CHANGE THAT WILL IMPACT THE SOCIAL ECONOMY AND GLOBAL WORLD?